Abundant Life Church member Steve Swaren is one of hundreds, working both in and outside a public school that serves many mid-County students. 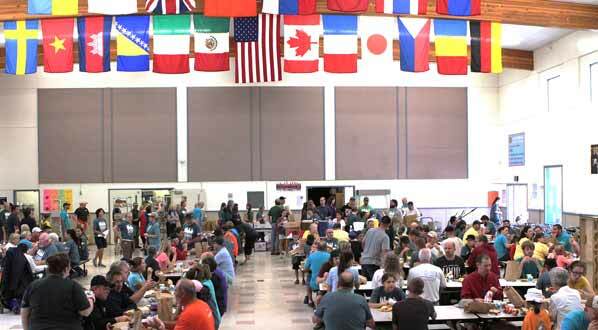 Some 700 members of the non-denominational Christian Abundant Life Church, “skipped” church services on Sunday, August 30, and instead headed out to Lynch Meadows Elementary School and Centennial Middle School. These schools, on the border of Portland and Gresham, serve hundreds of outer East Portland students, explained Abundant Life Church’s Pastor of Outreach and Involvement, Jeff Boxell. With the “Job Check-off Board” is Abundant Life Church Pastor Jeff Boxell, along with coordinators Tyler Younge, Valerie Stuart, and Charlene Dalzell. 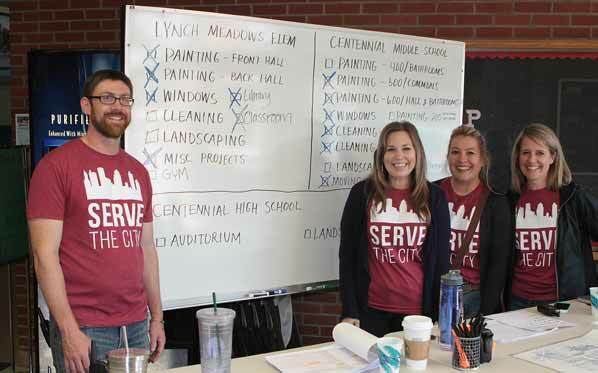 “We chose these schools for our first ‘Serve the City’ day, because one of our church members is a teacher here at the elementary school,” Boxell told East Portland News. When the church’s leaders met with school officials, Boxell said they saw an opportunity to be of service. 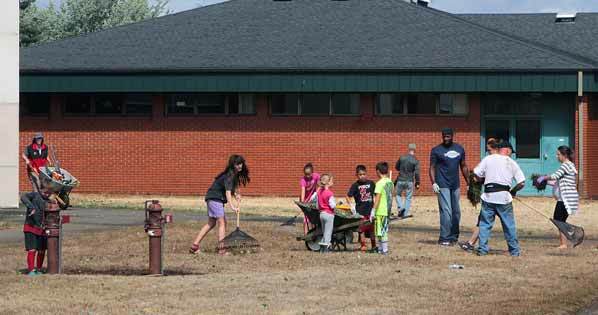 Family volunteers from Abundant Life Church clean up the yard outside the school. “With all the cutbacks in schools, especially with the custodial staff, we realized pretty quickly there were many needs here,” Boxell said. 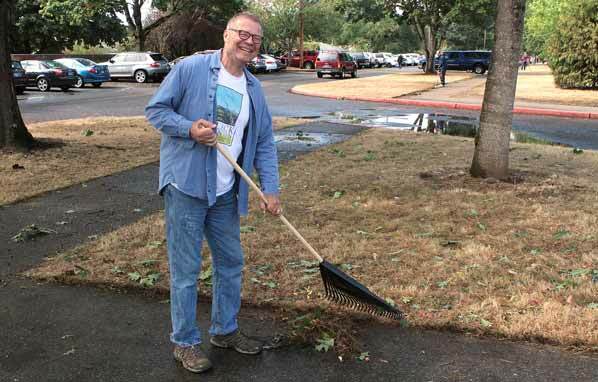 “There were a lot of dirty, un-maintained spaces that hadn’t been cared for in quite some time. “So, we ‘canceled’ church today, and our congregation came over to work at these two schools today,” Boxell smiled. The congregation did gather for a brief service in the middle school gym, dedicating themselves to the mission of cleaning and sprucing up the schools, he added. 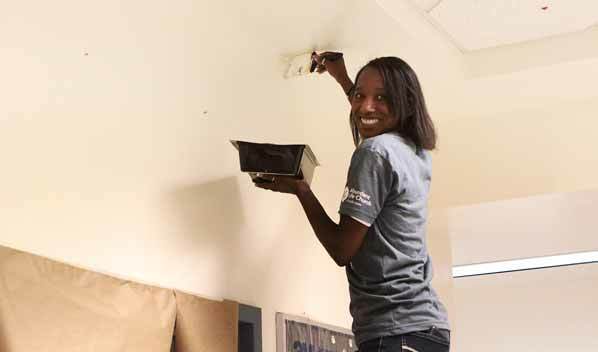 Volunteer Junda Pool touches up a paint job given to the middle school commons. Although scraping, cleaning, painting, raking, and planting has nothing in common with a worship service, Boxell reflected that it is nonetheless on target, helping them meet the mission of their faith group. 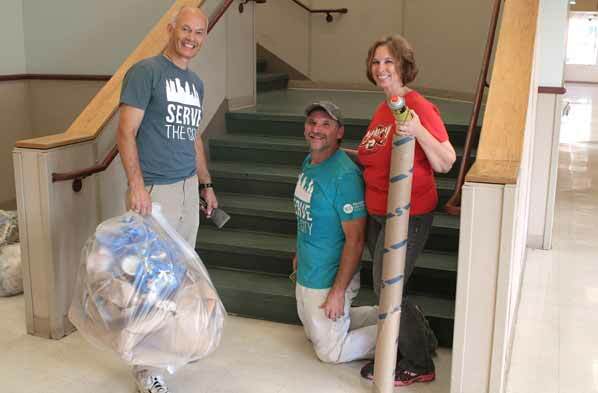 Cleaning up a stairwell are volunteers Gary Eckelman, and Brad Ruhl, and Beth Ruhl. “Jesus called us to serve,” the pastor said. “Jesus claimed that he came to serve, and in doing so, he gave his life as a ransom for us. I feel you’re never more like Jesus Christ than when you choose to serve other people. After completing their assignments, volunteers take a lunch break. The Abundant Life Church has campuses located in Happy Valley, Vancouver, and Sandy. For more information about this active faith group, see their official website: CLICK HERE.